1. What makes D-CRUNCH different from all the idol groups that debuted around the same time as you guys. The difference compared with other groups is all members participate in songwriting as well as choreography. We discuss and participate together, not only in the debut song and the title song of the second mini album but other tracks as well. Because of that, whenever album releases or performing on stage,every singer the same but we feel more passionate and work even harder. 다른 그룹과 차별성이라고 하면 저희 팀이 작사, 작곡, 안무 창작을 멤버들이 함께 참여하는 부분이라고 말씀드릴 수 있을 것 같습니다. 데뷔 곡과 두 번째 미니 앨범 타이틀 곡 뿐만 아니라 수록곡까지 같이 고민하고 참여했기 때문에 앨범이 나올때나 무대할때 모든 가수들이 그렇겠지만 더 애정을 가지고 열심히 하게 되는 것 같습니다. 2. Which singers are your inspiration on becoming an idol? There are many good seniors, but among the many others, hip hop groups that are sharing with the similar concept with us such as BTS, Block B, Icon, Big Bang are our inspiration. 많은 좋은 선배님들이 계셨지만 그 중에서도 저희 그룹과 같은 힙합 아이돌이라는 루트를 두고 계신 bts,블락비,아이콘,빅뱅 선배님들 영향을 많이 받았습니다. 3. 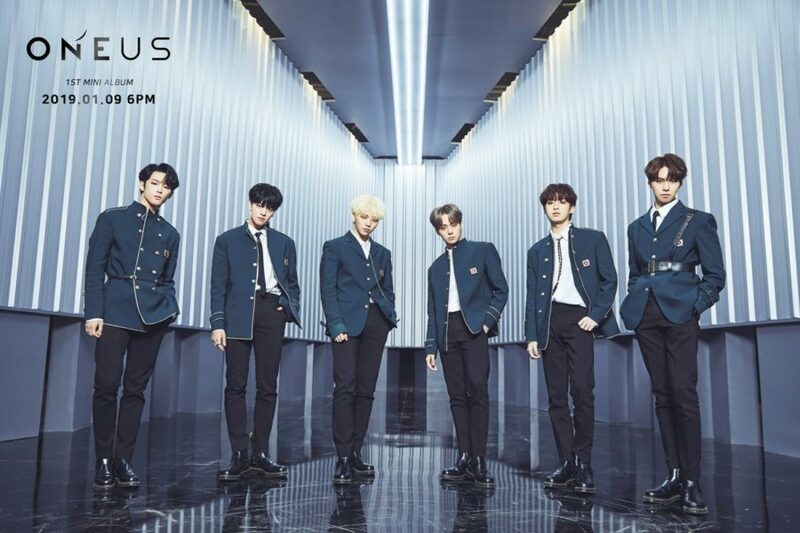 Which tv shows would the members want to be guest at? It seems like we couldn’t show our various sides since we are still a rookie, if there’s any program call us and we guarantee that we would do our best. In addition, since all members like to challenge, we would like to make an appearance on any program that is challenging. 아직 저희가 신인이기 때문에 저희의 다양한 모습을 많이 못 보여드린 것 같아서 불러 주시는 프로그램이 있다면 어디든 열심히 잘 임할 자신이 있습니다. 또, 팀 멤버들이 도전 정신이 넘치기 때문에 무언가에 도전하는 프로그램에 나가고 싶습니다. 4. What kind of album concept would you like to try in the future? Since we’ve released albums with hip hop base in the past, we used to show powerful performance that goes well with the strong beat. However, we can actually digest different concepts and transform into different styles like chameleon, so we can show our various sides to people. 앞서 발표했던 앨범들은 힙합을 베이스로 한 음악들이기 때문에 저희가 강렬한 비트에 맞춰서 파워풀한 퍼포먼스를 주로 보여줬었는데, 사실 저희는 어떤 콘셉트던지 카멜레온처럼 다양한 콘셉트에 맞춰 변화할 수 있는 그룹이라고 생각하기 때문에 다양하고 많은 모습을 보여드릴 수 있을 것 같습니다. 5. Which member changed the most, before and after debut? There are members still growing now. Dylan, our ‘maknae(youngest)’ has grown a lot taller compared to the time of our debut, haha! 멤버들 중에 아직도 키가 자라는 친구들이 있는데요. 막내 딜란이의 키가 데뷔전 보다 훨씬 많이 컸습니다 하하! 6. What has been your favorite song to perform? 다 저희가 직접 만든 곡이라 애정이 커서 고르기 힘들지만, 그중에 ‘I’m OK’입니다. 이유는 잔잔한 멜로디에 맞춰 공연할 때 관객분들이 플래시를 키고 호응해 주시는 모습을 보면서 많이 감동 받았고, 또 행복했기 때문입니다. 7. What do the members like to do when you don’t have any schedules? First of all, all 9 members are staying together. Normally, we stay in the hostel to have some talks or take a rest when we do not have any schedule. Recently, everyone is been spending own time in making songs for our next album. 우선 저희는 9명 전원 같이 숙소생활을 하고 있는데요. 스케줄이 없을 때는 멤버들끼리 숙소에서 이야기를 하거나 휴식을 취합니다. 요즘은 다음 앨범을 준비하고 있기 때문에 각자 메이킹하는데 시간을 쏟고 있습니다. 8. What do you miss the most when you are not in Korea? It is hard to answer as we still never been performing oversea. 아직 해외 스케줄을 해 본적이 없어 대답하기 어렵습니다. 9. 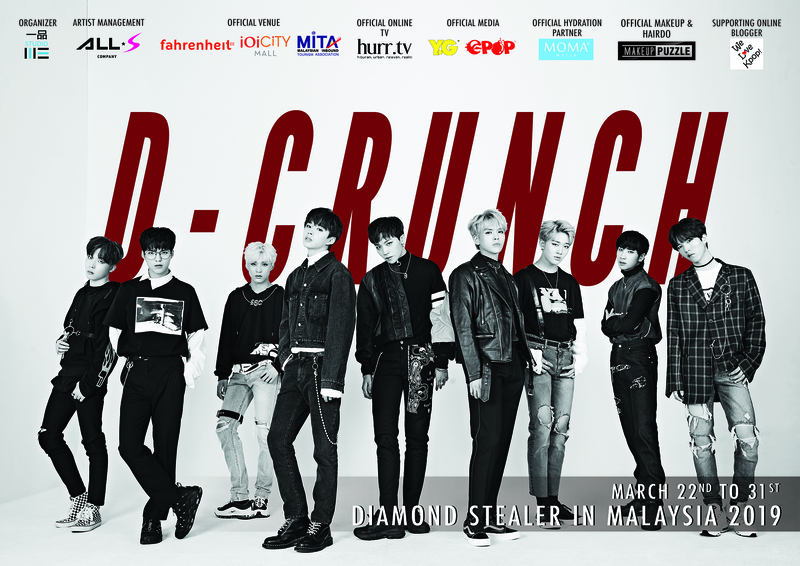 Define D-CRUNCH in one word and explain why? A ‘grown type’artist! As we still have a long way to go and we have a lot to show, we would like to show the public how we improve with our music and performance as time goes by. 성장형 아티스트! 입니다. 저희가 아직 부족한게 많고, 보여드릴게 무궁무진하기 때문에 음악적으로나, 퍼포먼스적으로 대중한테 점점 발전하는 모습을 보여드릴 것이기때문입니다. 10. Share with us a unique talent than the members have, other then music. Dylan: I play soccer well! I started playing when I was 5 years old, I played soccer with 6 years old class instead of 5 years old class! 딜란 Dylan– 축구를 잘 합니다! 5살때부터했는데 5살때 5살반(class)이아닌 6살반이랑같이축구를했습니다! Jung Seung: I am very artsy! I like handcraft and good in drawing. 정승 Jung Seung – 손재주가 좋아요! 뭘 만드는걸 굉장히 좋아하고 그림도 잘 그리는 편입니다하하Chan Young: I play computer game well! I play intermediate level for games that I first play! Hyun Woo: I am confident in all exercises that using body!! I am athletic. 현우 Hyun Woo – 몸으로 하는 운동은 다 가장 자신있습니다!! 운동신경이 좋습니다. Min Hyuk: I am good in comedy. Because I can make all members laugh well. 민혁 Min Hyuk – 개그에 재능이 있습니다.멤버들을 잘 웃기기 때문입니다. Hyun Ho: Jegichagi. I do enjoy playing jegichagi, and normally I can kick at least 50 times and above, so many people praise that I play it well. 현호 Hyun Ho – 제기차기입니다. 평소에 제기차기를 즐겨하는데 기본 50개 이상은 해서 주위에서 재능있다는 소리를 들어 왔습니다. Hyun Wook: I liked perfume since I was young, so I have the talent to identify most of the fragrance now. 현욱 Hyun Wook – 어렸을때부터 향수를 좋아했는데 지금은 대부분의 향수를 어떤 향수인지 구별할 수 있는 재능이 있는거 같습니다. Hyun Oh: My talent is doing makeup. I have relative work in the makeup industry, so I think it influences me a lot. 현오 Hyun Oh – 저의 재능은 아무래도 메이크업인 것 같습니다. 가족중에 메이크업 직업을 종사하시는 분이 계셔서 그런지 영향을 많이 받은거 같습니다. O.V: I have talent to mimic another’s voice quickly. Of course, I can’t do all!! O.V – 저는 성대모사를 빨리빨리 할 수 있다는 재능을 가지고 있습니다. 물론 다 잘하진 못하지만요!! 11. If you were to collaborate with other singers, who would it be? Since there are a lot artists we would like to collaborate with, so it is hard for us to choose someone. Since D-Crunch produces Hip Hop songs as base in majority, we would like to work with the Hip Hop singers. 콜라보하고 싶은 아티스트가 너무 많기 때문에 누구 한 분을 말씀드리기 너무 어려운데요. 디크런치가 힙합을 베이스로 하는 곡을 주로 쓰기 때문에 힙합 가수들과 많이 해보고 싶습니다. 12. Do you have any routine/secret cheer that you guys do before you go on stage? Tell us about it. Before going on stage, all 9 members will gather and shout out the “fighting(way to go)” slogan as well as recalling the reminder of the day to perform with our best for all people. 알려주세요. 무대에 올라가기 전에 그날 무대에 대한 리마인드와 9명 전원이 모여 무대를 보는 사람들에게 최선을 다 하고, 같이무대를 잘 만들어가자는 의미로 파이팅구호를 외치고 올라갑니다. 13. Other than fan meetings, how do you interact with your fans, especially the international fans? Dylan is the English speaker in our group. We always use English on V LIVE and the social media in order to communicate with our overseas fans. 저희 팀에 영어 담당 멤버 딜란이 있는데요. 외국 팬들을 위해 항상 v앱과 SNS에 영어로 해외 팬들과 소통하고 있습니다.